Wigan Athletic will be without defender Reece James for the rest of the season, boss Gary Caldwell has confirmed. The ex-Manchester United man hasn’t featured since the 3-1 win over Chesterfield on January 16, thanks to a foot injury that Caldwell last month admitted was a ‘mystery’. Thankfully the medics have finally got to the bottom of the problem, and the left-sided defender recently underwent corrective surgery. But with less than a month of the campaign remaining, Caldwell is resigned to having to manage without a player he claimed at the turn of the year had been Wigan’s most consistent up to Christmas. “Reece had an operation last Friday, to correct a small problem with his foot which hopefully is now fixed,” reported the Wigan boss. “It was quite a small operation and quite a short recovery time-scale. “He’s off his crutches now and will be back jogging in the next two-to-three weeks. “But I think he’d be struggling to get enough games under his belt to get match-fit (by the end of the season). “He’s somebody who wants to be out there, playing and training, and he probably didn’t help himself by pushing so much. Caldwell also confirmed captain Craig Morgan has ‘no chance’ of being fit for this weekend’s visit of Coventry. The former Wales centre-back picked up a hamstring injury in training last Thursday that forced him to miss the 5-1 victory at Shrewsbury. And although he is recovering well, he is nowhere near ready to return to the fold. “Craig has been running in training, and it’s great to see him progressing so quickly,” acknowledged Caldwell. 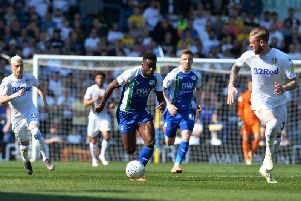 There was better news concerning right-back Reece Wabara, who picked up a hamstring injury of his own at the start of the second half at the Greenhous Meadow. “Reece is okay now, although he’s not back training fully,” added Caldwell. “He has done some work, so he has a chance of playing in Saturday’s game. Playmaker Michael Jacobs is pushing for a start after a solid week of training following his return off the bench at Shrewsbury. Caldwell has reported no fresh injury worries with Latics hoping to cement their position on top of League One.